I’m a big fan of Jill Howarth‘s wonderful artwork. Beautifully illustrated and designed, her work is beyond charming. Jill comes from a background in the toy industry, working as a designer and art director for Hasbro before becoming a full-time freelance artist. There’s a lot to see on her various websites so make sure to check them out. And if you’re as charmed with her work as I am, you’ll want to make sure to visit her Shamelessly Cute Society 6 store. 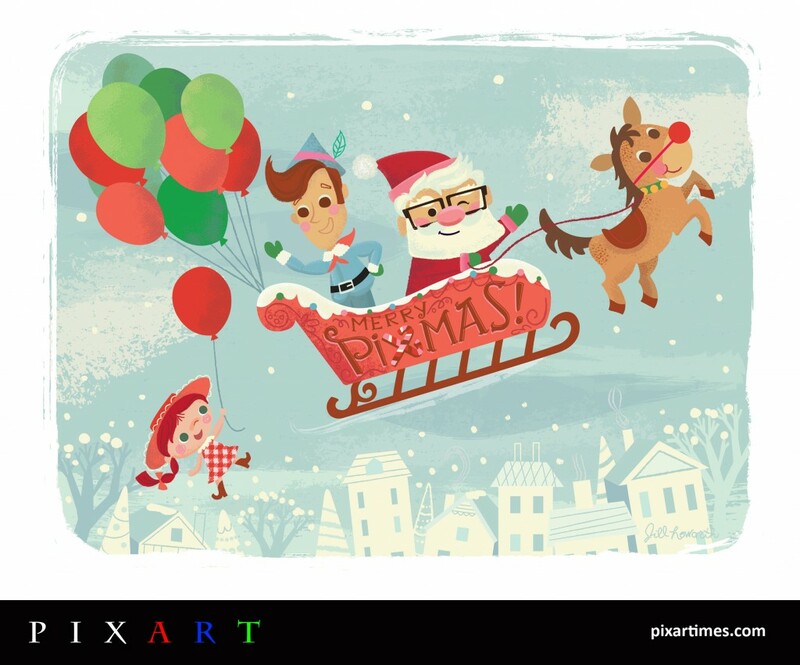 Our sincere thanks to Jill for contributing this great holiday-themed piece to PixArt. I can’t think of a more wonderful way to end the year. Everyone says this one is a tough question and I’d have to agree. Up and Ratatouille are right at the top, but you can’t beat the overall story and characters of Toy Story. And the fact that the sequels were consistently great really put it over the top for me. Might as well stay consistent here and say Woody. He’s the glue and heart that ties the whole series together. I was thrilled to be asked to do a December holiday-themed piece. I’m a big Christmas freak, so this was right up my alley! I knew right away that I wanted to do something with Toy Story characters and the parallels to Rudolph and the misfit toys were many. I could have done so many more! My son was disappointed I didn’t have Woody riding an ostrich amongst other mashups…Nemo as the fish that flies, Lightning McQueen with square wheels! He was full of ideas. Carl was an obvious pick for Santa, so I substituted balloons for the little umbrellas that the elves in Rudolph used for the toys as they sailed from the sleigh to their forever homes. I am a huge fan of mid-century kids book illustration and artists like Leonard Weisgard, Miroslav Sasek, J. P. Miller, Alain Grée, as well as contemporary illustrators/designers such as J. Otto Seibold, Bob Staake, Tad Carpenter, amongst many others. Draw what makes you happy! If you like it, chances are others will too. I’m proud to be a member of the Happy Happy Art Collective. You can follow our projects and other fun stuff at happyhappycollective.com and on facebook.com/happyhappycollective.